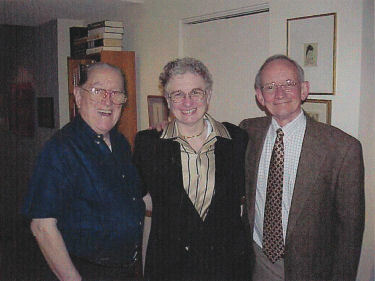 Ted Kooser (on the right) with friends of the Heritage Room, the late Dr. Norman Geske and former Library Director Carol Connor. Nebraska poet Ted Kooser served two terms as Poet Laureate of the United States, 2004-2006. Librarian of Congress James H. Billington announced Ted Kooser’s initial appointment as Poet Laureate of the United States in August 12, 2004 with this comment: “Ted Kooser is a major poetic voice for rural and small town America and the first Poet Laureate to be chosen from the Great Plains. His verse reaches beyond his native region to touch on universal themes in accessible ways.” Soon after Kooser’s term began, Billington and other observers were acknowledging Kooser as the hardest working Poet Laureate in recent memory. Kooser’s weekly American Life in Poetry newspaper column, begun as his “Poet Laureate” project, has been described as the most successful effort in a generation to introduce the public to new poets and poetry. The success of the column has led Kooser to continue it to the present time (2010). It runs in newspapers nation-wide. Kooser completed his second term as Poet Laureate in May 2006. Reviewers note that Kooser’s intense focus on his local and regional subject matter lends a special clarity and force to his articulation of universal concerns. Kooser’s disciplined striving to create poetry that reaches out to the widest possible audience has fueled demand for him to give readings, lectures and interviews. Ted Kooser was born in Ames, Iowa in 1939. He attended public schools there and graduated from Iowa State University in 1962 with a major in English Education. He taught high school for a year, and then entered the University of Nebraska. After one year as a full time graduate student in the English Department he went to work for Lincoln Benefit Life, an insurance company. He completed his M.A. in English at UNL by attending night classes. He remained in Lincoln and continued at Lincoln Benefit Life, working as an underwriter and then in several executive positions, including Second Vice-President-New Business and Vice President-Public Relations. He has lived in Lincoln and on an acreage near Garland. Kooser’s work has been reviewed in Saturday Review, The Hudson Review, and The New York Times Book Review. Writing in 1985, the critic William Cole noted that Kooser had “won just about all the honors given to poets.” These honors include two National Endowment for the Arts Fellowships, The Society for Midland Authors Poetry Prize, two Prairie Schooner Prizes, the Stanley Kunitz Poetry Prize and the James Boatwright Prize, among others. His Delights and Shadows won the 2005 Pulitzer Prize for Poetry. Reviewers describe Kooser as a poet who possesses a distinctive conversational voice that ordinary Americans understand and appreciate. Dana Gioia describes him as a specialist in short imagistic poems who has perfected “a highly charged kind of simplicity.” Gioia finds that as Kooser focused his efforts on recreating the rural culture of the Great Plains, his work has grown in intensity and integrity. Directness and honesty are essential to conversation in the places he writes about, and Kooser has refused to “bully or impress his audience” with verbal play. Working on the ground he has chosen, Gioia says, “Kooser has written more perfect poems than any poet of his generation…. [and] in a quiet way, he is also one of its most original poets.” William Coleman says that Kooser “knows more about small town people” than any of his contemporaries. The scope of Ted Kooser’s interests and activities is striking. Kooser is a visual artist with paintings and drawings in private and public collections. Kooser was editor, publisher, book designer and illustrator for his own Windflower Press, a one-man operation that specialized in contemporary poetry. Windflower Press (now inactive) garnered international recognition and awards for bringing new poetry to a broader audience and for promoting the work of younger poets. Whether promoting the work of younger poets or serving on the Nebraska State Economic Development Commission, Kooser has made the most of every opportunity to sustain and improve the communities to which he belongs. He has served as a gubernatorial appointee to the Nebraska Arts Council and the Certificate of Need Review Board of the State Department of Health. He has been a good friend of Lincoln City Libraries. He has served as a City Council appointee to the Lincoln City Library Board, and on the Board of the Lincoln City Libraries Foundation. He was a founder and elected President of the Nebraska Literary Heritage Association, which has helped to support the collections and activities of the Jane Pope Geske Heritage Room of Nebraska Authors here at Bennett Martin Public Library. 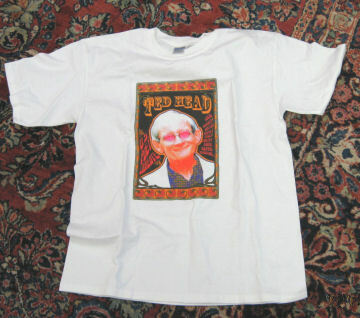 A Kooser fan’s Ted Head tee shirt, Heritage Room memorabilia. Many contemporary poets make their livings in the teaching profession, but Kooser, after what he refers to as “one disastrous year” in graduate school, made his career as a businessman. Kooser has a deep respect for ordinary people and useful labor. Speaking of his career with the insurer, Lincoln Benefit Life, Kooser says he enjoyed doing socially useful work there. He did however, at the same time, find the “immersion in abstraction” of the commercial world forbidding, and in his essay “Journey to a Place of Work” he describes how he sought to counter this by focusing on people and their stories. Some of his poetry focuses biting humor on what Kooser sees as the hazardous distance between the modern commercial world and the human soul. Kooser has been an avid promoter of local and regional literary communities, and has collaborated frequently with other Nebraska and Great Plains poets and writers. Kooser published a variety of little magazines over the years, an effort that lent a characteristic liveliness and humor to the local literary community. These magazines included The Salt Creek Reader (1967-1975), The Blue Hotel (1980-1981), and The Oak Branch Gazette (in the 1980s) among others. His Windflower Press pursues the same goals. He has collaborated on books with his friend Jim Harrison, with Bill Kloefkorn, and has contributed to many local and regional collections. Kooser and Harrison’s Braided Creek: A Conversation in Poetry (2003) won the 2003 Award for Poetry of the Society of Midland Authors. He has designed and illustrated books for other poets. Out of his love for the land, the rural people, the quiet and sometimes forlorn places of southeastern Nebraska, and his gift for striking observation and intense imagery, Ted Kooser has created poetry that reaches and moves people who have never visited the Great Plains. Does his work trace the gradual disappearance of American rural culture, or celebrate its endurance? Or does Kooser focus entirely on more modest themes: a particular landscape, the presence of the past, the hidden life of natural and human worlds, or our connection to things we seem too busy to notice? Readers will have to decide for themselves.